MLS training academies are becoming an increasingly important part of facility planning, something reflected in developments unfolding this year. Ongoing expansion has led to new academy plans taking shape, and a few existing organizations are bolstering their facilities as well. In the MLS expansion race, the focus when it comes to facilities is often on the stadiums. Having a sound plan for a new stadium—especially one that follows MLS preferences with a soccer-specific design concept in an urban setting—is a major part of any expansion bid, but so to is the academy. Along with giving organizations a training space for their MLS club, training complexes can serve multiple purposes by housing lower-division teams and providing space and services to grow the sport at the youth level. Over the next few months, MLS will see few developments that reflect the increasing importance of training academies. Orlando City SC is currently working on a training academy at Osceola Heritage Park, with the facility expected to open this summer. Located outside of Orlando in Osceola County, FL, Osceola Heritage Park was formerly used for spring training by Major League Baseball’s Houston Astros and included a ballpark and surrounding training fields. The ballpark, currently used by Minor League Baseball’s Florida Fire Frogs (High A; Florida State League), will remain in place, but Orlando City is taking over surrounding area by redeveloping the former baseball training fields and parking areas. The complex will be used by Orlando City of MLS and the NWSL’s Orlando Pride. A similar complex is also on tap in Foxborough, with the New England Revolution taking over land near Gillette Stadium to build a new training academy. Set to be fully completed this summer, the complex spans 68 acres and features 42,000 square feet of building space, along with three full-sized training fields, including two natural grass and one turf. The Revolution is still expected to pursue a new soccer-specific stadium in or around Boston, but the complex solidifies the organization’s facility slate while assuring at least one long-term tie to Foxborough in the event that a new stadium is built down the road. Another organization that is bolstering its facilities is D.C. United, which is building a new academy in suburban Loudoun County, VA. Within that complex will be a roughly 5,000-seat stadium that serves as the full-time home of Loudoun United FC—D.C. United’s new club in Division II USL Championship. The model is one that other organizations have used previously, including Real Salt Lake—whose complex includes a home for USL Championship’s Real Monarchs— as it allows the MLS organization to have full control over the venue of its Division II club while providing a central location for operations. Ground was broken on Loudoun United’s new stadium last week, and it is expected to open in August. Training academies are also becoming an important part of MLS expansion bids, and FC Cincinnati’s plans for a complex reflect how expansion clubs can plan their facilities. Currently under construction in suburban Milford, OH, the Mercy Health Training Center will feature three fields full sized, lighted fields—one turf, two natural grass—along with a separate area for goalkeeper training. It will also include a 30,000 square-foot building for the MLS team, with academy teams using a separate 4,000 square-foot wing—a design feature that will help the complex serve as a hub for youth soccer, as well as MLS operations. 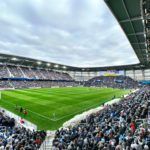 Temporary facilities were completed ahead of the current MLS season, but construction on the permanent first-team building is not slated to be conclude until later this year. With these facilities, there are a few common links. While providing ample room for MLS operations and other training space, the complexes also give the organizations a stronger presence in the suburban areas of their markets. With MLS teams emphasizing downtown-type settings for their stadiums, having a sprawling complex in outlying areas is a way for clubs to have a stronger regional presence while anchoring home matches in urban cores. It seems likely that training academies will continue to be a priority around MLS, both in expansion bids and for existing clubs. The facilities provide a necessary amenity for MLS teams, while also giving the organizations and soccer as a whole a stronger presence wherever they are built. Rendering courtesy Orlando City SC. This article appeared in the weekly Soccer Stadium Digest newsletter. Are you a subscriber? It’s free and easy to subscribe: Just click here!